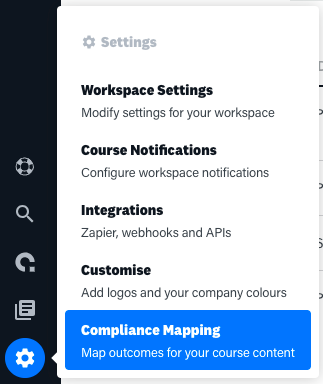 The Compliance Mapping tab provides an optional feature allowing Authors to ‘map’ their Learning Outcomes to individual content items on the fly. In the RTO world, this may help provide evidence that eLearning content meets the vocational competency requirements (Critical Aspects, etc.) outlined in accredited Training Packages. 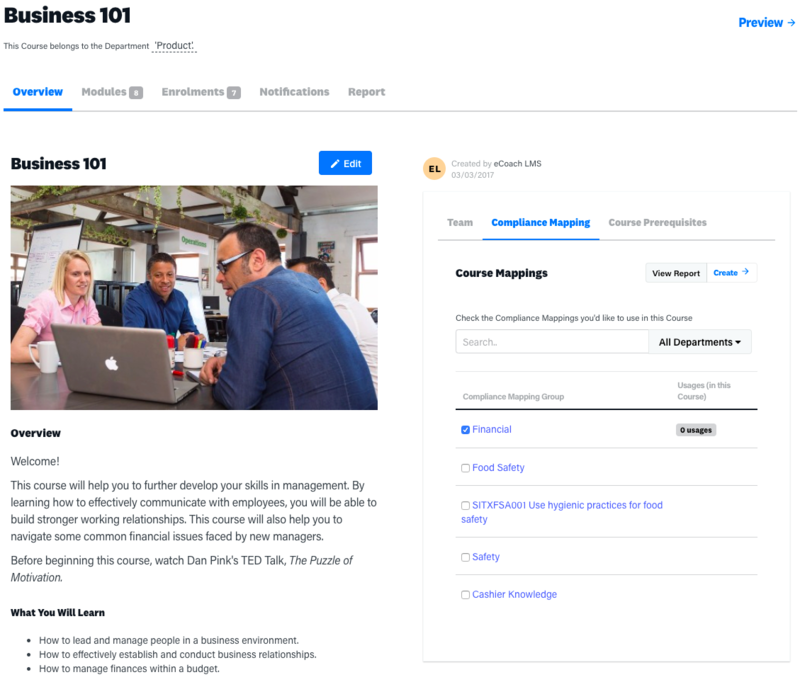 Using the Compliance Mapping tab can also help ensure that content covers particular skills and knowledge relevant to the industry area in which you are training. Mapping Reports can be used to display Usage throughout Lesson Modules (identifying any gaps). Compliance Mapping can be used to Report on Participant performance in Assessment Modules. 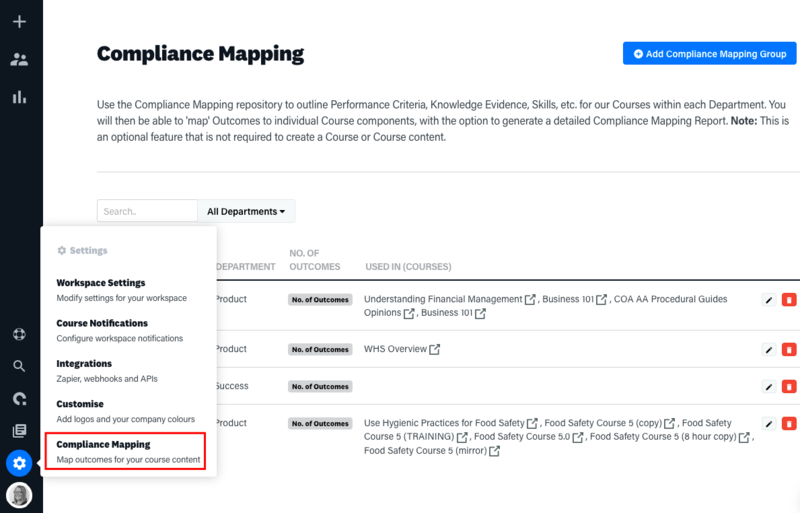 You can add Compliance Mapping to your Course under the Compliance Mapping tab on the Course overview screen. Simply search for the Learning Outcomes groups you’d like to add and check them from the list that appears. You can also view your Course’s Mapping Report by clicking the ‘View Mapping Report’ button on the top right of screen, which will take you to your Course’s Learning Outcome Report. To add Compliance Mapping, click on the ‘Compliance Mapping’ tab on the left navigation bar. From here, select the ‘Add Compliance Mapping Group’ button. 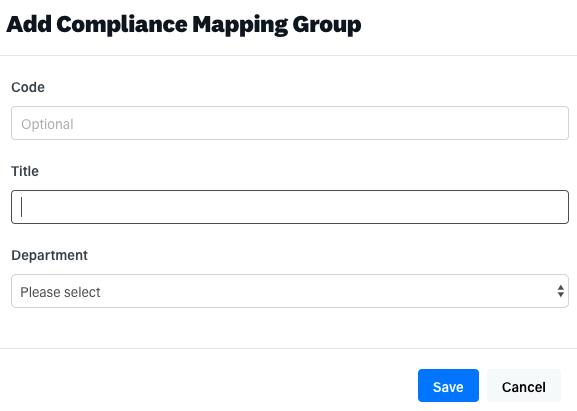 A screen will pop up, in which you can add a title and code for your new Compliance Mapping Group and select what Department you’d like to file it under. Once you’ve created your new Compliance Mapping Group, a popup will ask if you’d like to use default Learning Outcome categories or create your own. The default Learning Outcome categories are Required Skills, Required Knowledge, and Performance Criteria. To create your own, simply select ‘No Thanks’, and then ‘Add new Category’ from the Compliance Mapping screen. You can decide whether to display your new categories on Quiz Reports and/or Assignment Reports, and give them Parent Elements. To add your new Compliance Mapping Group to a Course, simply go back to the Course View and search for it in the Course Mappings screen. After making a selection, you will then be able to start mapping your Lesson content to your predefined Compliance Mapping (toward the bottom left of each Template).